I can do all things through Christ who holds the key. I can do all things through Christ who gives me hope. I can do all things through Christ who helps me cope. As long as I trust in the Lord. I can do all things through Christ who hears my prayers. I can do all things through Christ who always cares. Lesson 7 “We Pray to God” The teacher can emphasize that we can pray to Jesus and ask Him to help us. Lesson 10 “Mary Receives Good News” Mary prayed to God each day. She followed God’s will for her and God gave her strength to become the mother of Jesus. Lesson 30 “Pentecost” God gave the Apostles strength to go out around the world and tell people about Jesus. Lesson 13 “Mary Says ‘Yes!’ to God’s Gift” Because Mary was willing to cooperate with God’s divine plan for herself and the world, God gave Mary strength to become the mother of God. Lesson 19 “Growing in God’s Care” Jesus is the Good Shepherd who loves us and cares for us. We can always pray to Jesus and ask for His help. Lesson 20 “Jesus Loves Me” Because Jesus loves all children, He is a special friend we can talk to at any time and ask Him to give us strength to do whatever we need to do. Lesson 23 “Trusting in God’s Love” Trusting God means that with our cooperation, God will provide for our needs, because He has a divine plan for us. Lesson 6 “Saying ‘Yes!’ to God. At baptism, we say “Yes!” to God. God gives us strength to follow Jesus’ teachings and make the right choices. 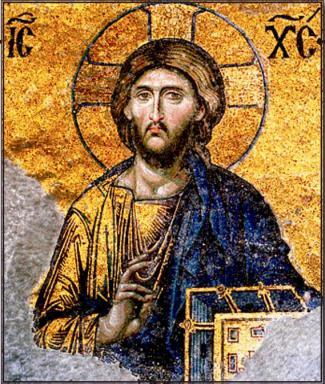 Lesson 7 “Jesus Sends His Holy Spirit” Jesus sends His Holy Spirit to help us be strong and follow his teachings. Lesson 8 “We Receive the Holy Spirit” The Holy Spirit helps us and gives us strength to do what Jesus wants us to do. Philippians 4:13 was selected because this verse appears on the arch to Antiochian Village Camp. Countless children and adults have passed under that arch, but how many have contemplated what this quotation really means? Philippians 4:13 is one of the most popular, yet perhaps one of the most misunderstood verses in the Bible. Does it mean that if I pray hard enough I can do (or have) whatever I want? Oftentimes what’s missing in our understanding of this verse is the acknowledgement of God’s will for us. In order to truly understand this quote, we must examine it in context. If we look at verse 11, St. Paul says, “…I have learned in whatever state I am to be content.” Things may not always go according to our plan, but as long as we trust in God’s plan for us we can overcome any obstacles we may encounter. 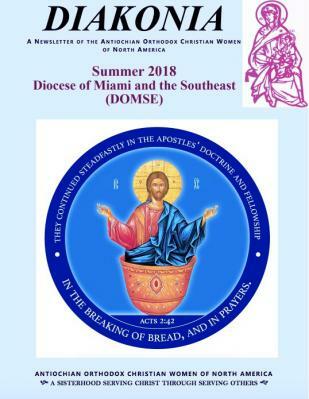 As we start a new chapter in the life of the Diocese of Miami and the Southeast, we have been working diligently on many fronts to build all aspects of the diocese according to a new vision of rejuvenation and growth. The main theme is that we, the faithful, need to increase our knowledge noeticly and spiritually with regard to God in accordance with Jesus' prayer to His Father: "this is eternal life, that they may know You, the only true God, and Jesus Christ whom You have sent." (John 17:3). As I have been emphasizing during my weekly pastoral visits to the DOMSE parishes, we need to "up our spiritual game" a notch or two on a continuous basis and while remaining humans work conscientiously on acquiring the attributes of God. As life goes, it has been a year of "ups and downs" for our Diocese. 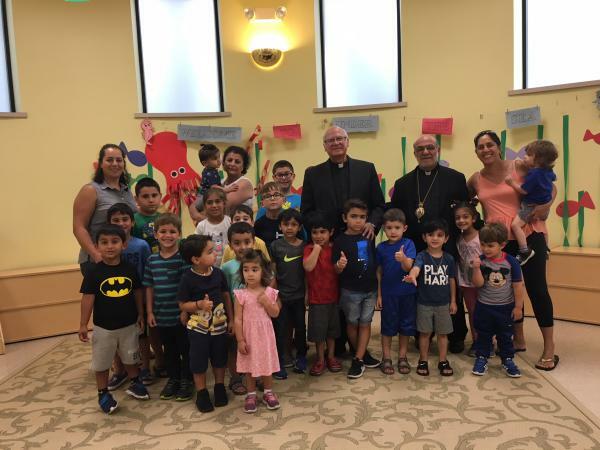 Last summer we celebrated our beloved Bishop ANTOUN's lifetime of service at the Archdiocese Convention in his hometown of Miami. A few months later, we laid him to rest at the Antiochian Village. We welcomed our new Bishop NICHOLAS and had our first Winter Retreat with him in Atlanta in January. We said a reluctant goodbye to our Spiritual Advisor, Fr. Stephen Rogers, as he started his retirement and welcomed him as our first Mid-Winter retreat speaker! The Village sponsors our Clergy Synaxis annually. This year it falls November 6–9. 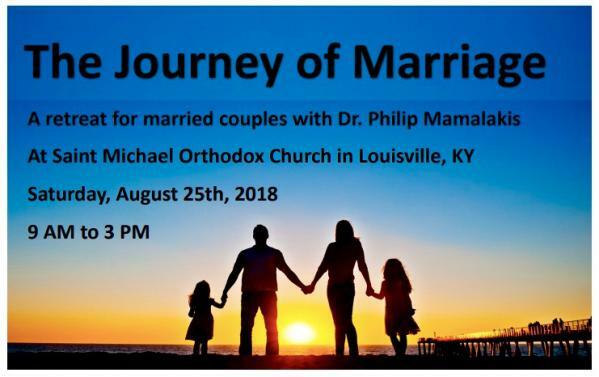 Although this is sponsored jointly by the Village and the Diocese of Oakland, Charleston, and the Mid-Atlantic, it is open to all clergy. 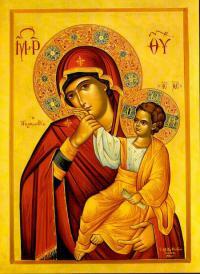 Very kindly, we ask that our diocesan clergy make arrangements to stay for the entire Synaxis. Once again, you can make arrangements for your accommodations with the Antiochian Village. We will be asking Fr. Anthony Yazge to send out a schedule for the Synaxis at a later time. We want to take this opportunity to invite all deacons to our annual Deacons' Retreat, which will be the weekend of Sept 7–9, 2018. This will be held at the Antiochian Village and at St. Mary Church in Johnstown. The speaker will be Fr. David Hester. For more information, please be in touch with Dn. Peter Maris at peter@pgmaris.com as well as the Antiochian Village Conference Center for accommodations. Coordinators for the Department of Christian Education recently attended the Parish Life Conferences throughout the Archdiocese. Each coordinator networked with parishioners and priests to offer the services of the department to provide training for teachers, or church school directors. Our trainers can also instruct in areas of Adult Education and through other theologically inspiring topics. Many excellent opportunities are currently in the planning stage and most will take place this fall. If you are interested in attending any of these sessions, contact your coordinator or the Department for more information. All are welcome! Watch our website or like our Facebook page to get up-to-date information on all of these opportunities in various dioceses. If you are interested in hosting a training at your parish, please contact Leslie Atherholt at aodce. 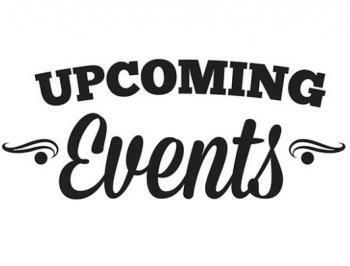 events@gmail.com or 717-747-5221. St. Nicholas Orthodox Church in Bridgeport, CT will host a Teacher Training II workshop for their teachers. Tentative date is Saturday, Sept. 29. Other parishes and jurisdictions are welcome to attend. 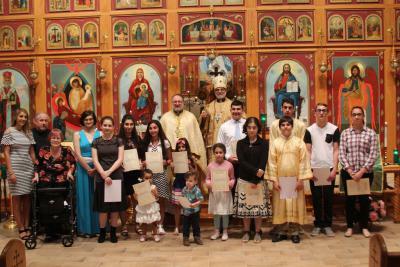 St. George, Little Falls, NJ will host a custom program for novice and advanced teachers for all the Orthodox churches in the area. This training is tentatively scheduled for October 20. Holy Cross Orthodox Church in Linthicum, MD will host a Teacher Training II workshop, tentatively scheduled in early November. Here are the "Prayers to the Most Holy Theotokos for Every Day of the Week" of Schema-hieromonk Nilus of St. Nilus of Sora Skete (+1870). By her holy intercessions may we all be saved! His Grace Bishop THOMAS recently visited The Basilica of St. Mary Antiochian Orthodox Church in Livonia, Michigan, with Fr. George Shalhoub. 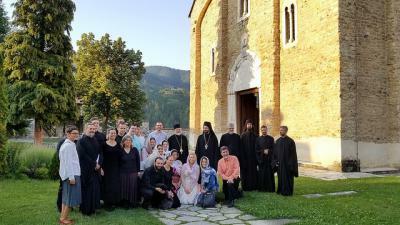 While in the beautiful Great Lake state, he also visited the Holy Dormition Orthodox Monastery in Rives Junction (under the omophorion of His Eminence Archbishop NATHANIEL of the Romanian Orthodox Episcopate of the Orthodox Church in America). 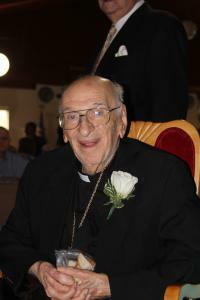 On Sunday, May 20th, we celebrated the 100th Birthday of our pastor emeritus, the V. Rev. Fr. Herbert Nahas. Fr. Herb made a special point of personally greeting all of the parishioners and guests as they entered the church hall following the Divine Liturgy. Our Parish Council Chairman, John Moses, welcomed our parishioners and visitors from the community who have known and loved Fr. Herb over the many years of his service to our parish of St. Mary. A letter of congratulations from Metropolitan JOSEPH was read by our pastor, the V. Rev. Fr. George Alberts, and Fr. Herb was presented with a citation from the mayor of Wilkes-Barre, Tony George. He also later received citations from the Pennsylvania Senate and House of Representatives. Fr. Herb gave a heart-felt thank you to everyone and blew out the candles on his birthday cake before taking his leave. We pray that Fr. Herb will be with us for many more years! Beloved in the Lord Jesus Christ! I greet each of you in the name of our Savior the Lord Jesus Christ as we embark upon a new church year. The Lord grants us to see the dawn of another new year for our repentance, nothing else. It is not given carelessly or frivolously and because it is God's gift to us; we will have to give an account of how we spend the gift freely given to us. We mark the passage of time primarily in one of two ways: 1) according to the secular calendar or 2) according to the church's cycle of fasts and feasts, the commemoration of saints, and the great feasts of the Lord. If we mark our time according to the secular calendar, we will find little time for God and the spiritual life. Our lives will pass rapidly (this in and of itself should give us pause) and our days will be passed with work responsibilities, family responsibilities, and holidays. There is nothing wrong with any of these things in and of themselves. However, when these responsibilities crowd out the spiritual life we begin to adopt a secular or worldly attitude about life and death. 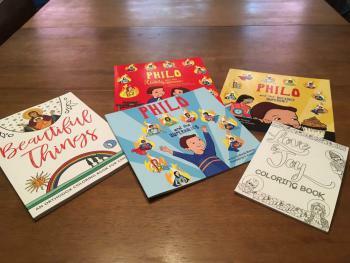 The SuperHolies series of books by Mireille Mishriky includes three books from 2016 to date, with more to come: Philo and the SuperHolies, Philo and the Patience SuperHoly, and Philo, Rose, and the Joy SuperHoly. Each book explores the “SuperHolies” (the virtues mentioned in the Scriptures as the fruit of the Holy Spirit), which can be “activated” in our life when we ask for God’s help. Each book tells about a time when Philo (a Coptic Orthodox boy) finds himself in a tough spot, remembers the SuperHolies, and then prays by making the sign of the cross. This activates the “SuperHolies” in his life and helps him respond as he should! Love & Joy Coloring Book by Draw Near Designs, copyrighted 2017, is a child-sized (or purse sized!) coloring book with 25 spreads featuring saints of the Orthodox Church and a quote from/about each. 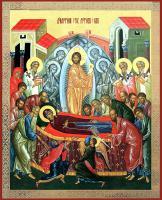 The Twelve Great Feasts and Pascha, taken together, are an overview of the life of our Lord. While it is important for our children to know about His miracles and teachings, it is just as important for them to know the main events of His life story. Our salvation resides in His life. Furthermore, just as we are baptized into Him, our own story—our life—must rest on His. Jesus’ life comprises the “foundational story” for Christians. A foundational story answers the ultimate questions of life, death and why we are here, and guides our thoughts, values, and actions. The Christian story provides answers to all these questions and gives us the virtues of faith, hope, and love that, even if not recognized as such, influence our attitudes and actions and curb the anxiety that comes from unexpected events and uncertain times. It is a strong foundation. I greet you as we celebrate these most joyous feasts, the Transfiguration of the Lord Jesus Christ and the Dormition of the Most Holy Theotokos! These feasts coincide with the holy fast of the Dormition as well as the new ecclesiastical year which is just around the corner. Most importantly, these two great feasts lead us to the very heart of Orthodoxy-union with God through His energies and our ascetical efforts. These two feasts also remind us that ultimately this is our purpose and goal in life-experience of the Uncreated Light and full participation in the life of Christ. If we are to experience the glory and salvific power of this Light that purifies our souls, we have to cooperate. We have a role to play. We have gathered some ideas of games that can be played in Sunday Church School. Those of us who are on summer break can take advantage of this time to review these, select the ones that will work with our class, and then have them available for the upcoming year. Some of these games can be prepared ahead of time. Others we will just want to be familiar with so that we have them as an option for use with our lessons. Let’s get ready to have some fun with our Sunday Church School classes! Find some Orthodox game ideas here. 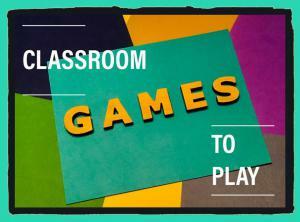 This page offers 12 games that would each be a fun way to review or test learning at the end of a lesson. You may want to gather and prepare some of the required equipment so that you’re ready to go when you want to play one of these games with your class! Refreshed and renewed, today is a big day as we venture eight centuries back and a few hours west towards Monastery Studenica, one of the largest and richest monasteries. It was founded in 1190 by Stefan Nemanja, also the founder of the medieval Serbian state and father of St. Sava of Serbia. We cut through the thick forest on a winding road wondering how these sites were even chosen. Soon we see the rushing Studenica River (after which the monastery is named) and are told that the water is particularly cold, thus the name Studenica derived from the old word “studeno” or cold. We arrive at the picturesque monastery guarded by stone gates and enter the main church dedicated to the Dormition of the Theotokos. One is transported back to medieval Serbia! Renovations are underway to restore this treasure as we encounter scaffolding. Marko, the man in charge of the restoration and cleaning of the frescos, is eager to show us what we’ve come to see. We enter the church and immediately see the above-ground tomb of St. Sava’s father Stefan Nemanja (St. Simeon the Myrrh-Flowing) on the right, the sarcophagus and uncorrupt relics of his brother St. Steven the First Crowned ahead to the right just in front of the iconostasis, and his mother and Stefan Nemanja’s wife Anna – St. Anastasia on the left. The sarcophagi are heavy laden in silver and gold, beautifully preserved, and respectfully covered during the renovation. Marko is quick to remove the covers as he sees that we are not just tourists, but pilgrims who have come to venerate these holy and beloved saints. The 65th Annual Diocese of Ottawa Eastern Canada and Upstate New York Parish Life Conference was held in our beautiful city of Halifax June 28-July 1, 2018. We worked hard to ensure that these four days were some of the best days our guests spent outside of their home parishes. Our schedule was dense with activities and events that drew everyone together spiritually and in fun. In Halifax we are well known for our warm hospitality. This is most true in our home Parish of Saint Antonios. The weekend opened with a delicious welcome dinner following the tour of our new home at Saint Antonios Church. Our guests were treated to the delicious taste of Halifax; offering a generous array of seafood, from lobster to oysters and much more! 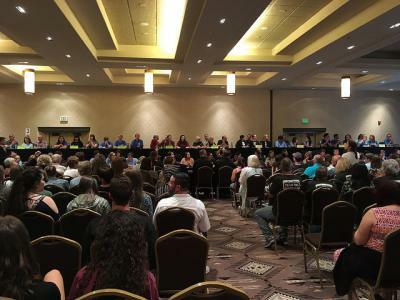 Successful PLC is Held in "The City of Holy Faith"
In June 2018, the largest gathering of Orthodox Christians in the 420-year history of Santa Fe, New Mexico occurred during the Diocese of Wichita Parish Life Conference. It was held for the first time ever in this city and state and was hosted by Holy Trinity Orthodox Church. Santa Fe is the oldest city in New Mexico and one of the oldest in the United States. Santa Fe is known as "The City of Holy Faith" and also "The City Different." It is the oldest continuous seat of government in America and yet, the true seat of government – the Altar of God and the greatest event in the cosmos – was celebrated by dozens of clergy and our Beloved Bishop, His Grace Bishop BASIL, during the Hierarchical Divine Liturgy. The location was the Eldorado Hotel and Spa and the conference attendees enjoyed the largest Hospitality Suite in the history of PLCs! It was in the hotel's Presidential Suite with more than 1,500 square feet of interior space and a 2,200 square foot penthouse patio offering stunning panoramic views of the city and the Sangre de Christo Mountains. 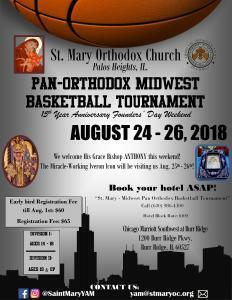 On behalf of St. Mary Orthodox Church of Palos Heights, IL and the Diocese of Toledo and Midwest, you are invited to our Pan-Orthodox Midwest Basketball Tournament, to be held on August 24–26, 2018. Over this same three days, our parish of St. Mary will be also celebrating our Fifteen Year Anniversary Founders' Day Weekend. 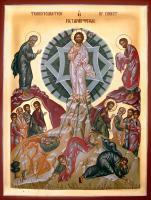 His Grace Bishop ANTHONY will preside over the festivities, and the miracle working Iveron Icon will bless us with a visit on August 25 and 26. The weekend includes a welcoming event, the basketball tournament, Hafleh and Awards Ceremony, and more! All other information (age limit, pricing, addresses, etc.) is included in the attached forms below.